Parents of children with special needs, mostly struggle to, first, come to terms with the diagnosis, and then to deal with the associated challenges, including communication. But they are not alone. There are others who have been there and also helping other parents work on these issues. In our initiative, World Through Their Eyes, we spoke to Akila Vaidyanathan, Founder, Director of The AMAZE Charitable Trust, Coimbatore and Founding Member of the Autism Society of India. She shared with us a list of tips that could help other parents, like herself. 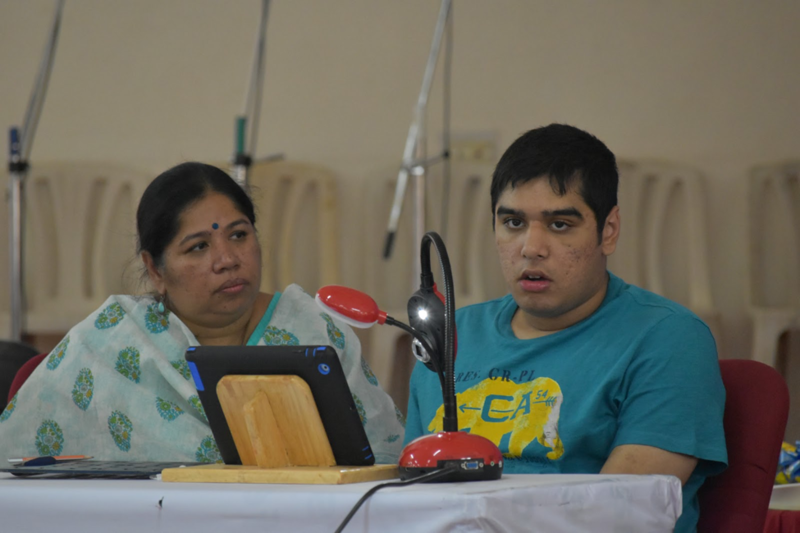 Akila is the parent of Nishant, a 22-year-old with Autism and Apraxia of speech, who is an intern with AMAZE. She was working in the software industry, before Nishant received his diagnosis, after which, she trained herself with a host of courses, to understand autism better. She did DSE Autism, MSc Applied Psychology and multiple international certificate courses like RPM, PECS, AT Tools, FIE and Applied Drama. With a passion for technology, she is always looking for innovative methods and solutions, that help persons with disabilities, improve their quality of life. She uses her vast experience to create awareness about Autism through various forums and media. Usually, there’s almost an expectation from the parent, that the child will be something like the parent, especially when the child does something positive. It is typical of a family to look at it as the gene pool being passed on. When a child has special needs, the family sees it as, “It can’t be. My gene pool cannot have a defect”. Often, there is denial and even blame, blaming each other or each other’s families. Often mothers feel they are responsible. Instead, they could begin by looking into the child’s strength, abilities, needs, and challenges. This leads to Akila’s second tip to parents! Quoting Kahlil Gibran, she highlights the need to look at your child with their own purpose because each of us is unique and different. Letting your child be their own person is the best gift you can give your child. Tip 3: Explore and Express! Children with special needs probably learn using different learning methods, compared to how we learn. Hence they communicate in a way that is different from how we do. As simple and easy as it sounds, this is a whole new paradigm shift for a parent, and one that is needed! With this acceptance, the parent will allow the child to express themselves in their own ways. Expose your child and allow them to respond to multiple modes of communication. These could include gestures, picture charts etc., which makes them less anxious to attempt speech. This might make them more willing to repeat words, which might have been more stressful earlier, because of the lack of acceptance. The child should feel accepted, even when they don’t use words to communicate. Create opportunities for communication throughout the day. Don’t pre-empt or make it too easy for them to access everything in a way that requires no communication. Do it even if it means that you sabotage the environment, like hiding something or viewing things in smaller installments. If your child likes chocolates, give it in smaller installments rather than the whole thing, at one go. This will make them ask for more. Tip 6: Get your Hands Dirty! Get on the floor and play with your child! This is going to help them understand another aspect of their life – Social Aspect. When the child watches someone else play a game, they learn to understand visually and anticipate something. It is a change in pattern. Though hard to explain, your child’s interpersonal skills start developing when you play informally with your child, through games or even silly interactions. Be interactive with your child to build reciprocity. Reciprocity between two people lays the foundation for social interaction. This lets the child understand that there is one more person in the room that they are interacting with. Once the child starts interacting, you can then expand on it. Your child may be processing one of their senses, more dominantly than the others. They may be using or focusing on the visual, more than the auditory or tactile senses or vice versa. How do we find this out? A child may stim with visual movements (visual channel) or hum all the time (auditory channel) seeking information. So observe the child’s sensory pattern. Give inputs appropriate to their sensory pattern. Don’t block it (like humming or tapping) as inappropriate behaviour. You could use this drama-based technique for a child who is tactile. Take some cream and put it on your child’s face, and as you start doing a facial for your child, you can start talking to your child. You will have their attention because the tactile channel is open. The parents may not be experts in these techniques, but the parent usually knows their child’s pattern. Leverage it to enter their world! Do you have tips that you would like to share with other parents? Let us know in the comments section below!